Reading and share top 44 famous quotes and sayings about Baptized by famous authors and people. Browse top 44 famous quotes and sayings about Baptized by most favorite authors. 1. "The filling of the Holy Spirit brings a sharp separation between the believer and the world.Actually, after Pentecost, they were looking at another world. They really saw another world.Nowadays, we perceive that even a large part of evangelical Christianity is trying to convert this world to the church. We are bringing the world in head over heels--unregenerated, uncleansed, unshriven, unbaptized, unsanctified. we are bringing the world right into the church. If we can get some big shot to say something nice about the church, we rush into print and tell about this fellow and what nice things he said. I don't care at all about big shots because I serve a living Saviour, and Jesus Christ is Lord of lords and King of kings. I believe every man ought to know this ability to see another world." 2. "I, Hasan the son of Muhammad the weigh-master, I, Jean-Leon de Medici, circumcised at the hand of a barber and baptized at the hand of a pope, I am now called the African, but I am not from Africa, nor from Europe, nor from Arabia. I am also called the Granadan, the Fassi, the Zayyati, but I come from no country, from no city, no tribe. I am the son of the road, my country is the caravan, my life the most unexpected of voyages." 3. "I was baptized alongside my mother when I was 8 years old. Since then, I have tried to walk a Christian life. And now that I'm getting older, I realized that I'm walking even closer with my God." 4. "For in Christ Jesus you are all children of God through faith. As many of you as were baptized into Christ have clothed yourselves with Christ. There is no longer Jew or Greek, there is no longer slave or free, there is no longer male or female; for all of you are one in Christ Jesus." 5. "So they took the blossoms of the oak, and the blossoms of the broom, and the blossoms of the meadow-sweet, and produced from them a maiden, the fairest and most graceful that man ever saw. And they baptized her, and gave her the name of Blodeuwedd." 6. "We have seen some gatekeeping or fencing-the-table language already beginning to rear its head in this context. One needed to be baptized to take the meal; one needed to repent to take the meal; one needed a bishop or his subordinate to serve the meal. This was to become especially problematic when the church began to suggest that grace was primarily, if not exclusively, available through the hands of the priest and by means of the sacrament. One wonders what Jesus, dining with sinners and tax collectors and then eating his modified Passover meal with disciples whom he knew were going to deny, desert, and betray him, would say about all this. There needs to be a balance between proper teaching so the sacrament is partaken of in a worthy manner and overly zealous policing of the table or clerical control of it." 7. "However, ironically, I was baptized Presbyterian, and went to a Quaker school for twelve years." 8. "I let him take my hands away from my face. "Oh speak, again bright angel. ""I don't think even Shakespeare is going to do it this time," I told him. "I mean, can't we not be daemon? Can't we convert or be exorcised or something?" "Call me but Love and I'll be new baptized. Henceforth I will be . . ." he thought about it, shrugged then peered intently into my eyes, "whatever you want me to be. You're the magnet. I'm just a pile of metal filings. I move only because of you. I have shape only because of you. Whatever shape you give me. And when you go, I fall apart." 9. "The Church is everywhere represented as one. It is one body, one family, one fold, one kingdom. It is one because pervaded by one Spirit. We are all baptized into one Spirit so as to become, says the apostle, on body." 10. "I gave my life to the Lord at 12. I was baptized at 12." 11. "If you ask three people what it means to be Christian, you will get three different answers. Some feel being baptized is sufficient. Others feel you must accept the Bible as immutable historical fact. Still others require a belief that all those who do not accept Christ as their personal savior are doomed to hell." 12. "Everything a baptized person does every day should be directly or indirectly related to the Corporal and Spiritual Works of Mercy." 13. "Whose boys are those with the holes in their pants? "I cringed. How would my grandpa answer such an embarrassing question? "Those are my daughter's children, my grandchildren," Grandpa spoke as if he'd just been asked who had won first place in a foot race or just been baptized into the church. "Those pants are very well ironed," the stranger said." 14. "Spirituality is no different from what we've been doing for two thousand years just by going to church and receiving the sacraments, being baptized, learning to pray, and reading Scriptures rightly. It's just ordinary stuff." 15. "Marines getting baptized? This used to be a place of men with pure warrior spirit. Chaplains are a goddamn waste." 16. "Baptized in a river when I was a teenager. I go to church most Sundays. My favorite Bible verse is ‘Jesus wept. '""Because it's the shortest?" He almost smiled."No. Because it says that Jesus knew what it meant to grieve. He'd just let his best friend in the world die of illness when he could have gotten there in time to save him. I'm thinking he was between a rock and hard place, and the hard place let his friend die. He grieved. Then, when he could, he went and raised his friend from the grave, and he knew that if he did that, he'd die himself." 17. "The poet craves emotion, and feeds the fire that consumes him, and only under this condition is he baptized with creative power." 18. "I was baptized one foggy afternoon about four o'clock. I couldn't think of any names I particularly wanted, so I kept my old name. I was alone with the fat priest; it was all very quickly and formally done, while someone at a children's service muttered in another chapel. Then we shook hands and I went off to a salmon tea, and the dog which had been sick again on the mat. Before that I had made a general confession to another priest: it was like a life photographed as it came to mind, without any order, full of gaps, giving at best a general impression. I couldn't help feeling all the way to the newspaper office, past the Post Office, the Moroccan café, the ancient whore, that I had got somewhere new by way of memories I hadn't known I possessed. I had taken up the thread of life from very far back, from as far back as innocence." 19. "She went by the name of Belisa Crepusculario, not because she'd been born with it or baptized it, but because she herself had searched until she found the poetry of 'beauty' and 'twilight' and cloaked herself in it. She made her living selling words." 20. "The actual companionship of the Holy Ghost, the divinely--bestowed right to His ministrations, the sanctifying baptism with fire, are given as a permanent and personal possession only to the faithful, repentant, baptized candidate for salvation; and with all such this gift shall abide unless it be forfeited through transgression." 21. 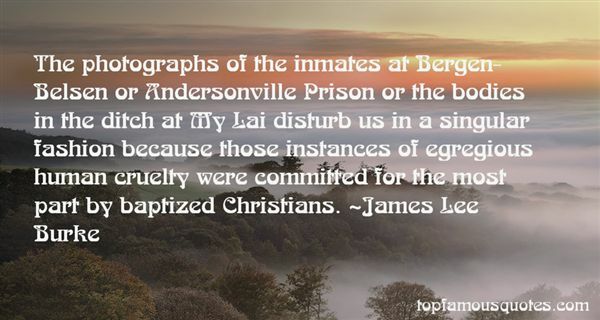 "The photographs of the inmates at Bergen-Belsen or Andersonville Prison or the bodies in the ditch at My Lai disturb us in a singular fashion because those instances of egregious human cruelty were committed for the most part by baptized Christians." 22. "Probably no other meeting we hold in the Church has the high referral and future baptismal harvest that a baptismal service does. Many of the investigators who attend a baptismal service (that is, the service of someone else being baptized) will go on to their own baptisms. That is more likely to occur if this service is a spiritual, strong teaching moment in which it is clear to participants and visitors alike that this is a sacred act of faith centered on the Lord Jesus Christ, that it is an act of repentance claiming the cleansing power of Christ, that through His majesty and Atonement it brings a remission of sins as well as, with confirmation, membership in His Church." 23. "He that believeth and is baptized shall be saved; but he that believeth not shall be damned." 24. "Well, ain't it a small world, spiritually speaking? Pete and Delmar just been baptized and saved. I guess I'm the only one that remains unaffiliated." 25. "If you try to avoid or remove the awkward quality, it will pursue you. The only effective way to still its unease is to transfigure it, to let it become something creative and positive that contributes to who you are.Nietzche said that one of the best days in his life was the day when he rebaptized all his negative qualities as his best qualities. Rather than banishing what is at first glimpse unwelcome, you bring it home to unity with your life…..One of your sacred duties is to exercise kindness towrd them. In a sense, you are called to be a loving parent to your delinquent qualiites"
26. 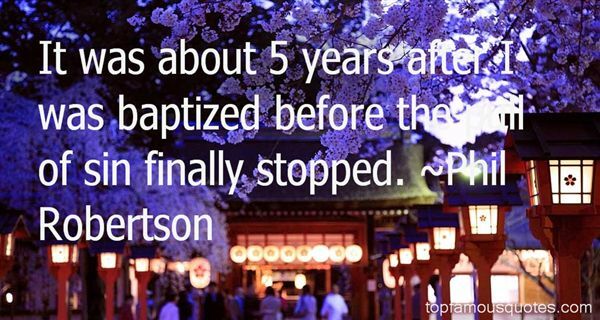 "In 30 years Christians will have baptized their picture of Christ. He won't be a nice, banal, meek, and bearded man with softly permed hair. Instead, he will fill our imaginations more solidly, more invasively , more unexpectedly. Christ will become That Man who changes people, someone who jumps off a bumper sticker and mediocre praise songs and into lives." 27. "You can wake up every day looking forward to new adventures with hope smiling brightly before you because you have a Savior. You are baptized in His Church.... You just need to stay in, pressing forward with a brightness of hope to your heavenly home." 28. "He simply painted the portrait of some aristocratic Mesalina, and was tactful enough to let Cupid hold the mirror in which she tests her majestic allure with cold satisfaction. He looks as though his task were becoming burdensome enough. The picture is painted flattery. Later an 'expert' in the Rococo period baptized the lady with the name of Venus. The furs of the despot in which Titian's fair model wrapped herself, probably more for fear of a cold than out of modesty, have become a symbol of the tyranny and cruelty that constitute woman's essence and her beauty." 29. "She gave me another piece of information which excited other feelings in me, scarcely less dreadful. Infants were sometimes born in the convent; but they were always baptized and immediately strangled!" 30. "I've shepherded a good many people through their lives, I've baptized babies by the hundred, and all that time I have felt as though a great part of life was closed to me. Your mother says I was like Abraham. But I had no old wife and no promise of a child. I was just getting by on books and baseball and fried-egg sandwiches." 31. "I'm a child of God first. Before I became a celebrity, I was baptized a Christian." 32. "You don't have a soul, so you can't be baptized. All animals are like that. I think it's unfair and sometimes I don't believe it. After all, what would heaven be without birds or dogs or horses? And what about trees and flowers? They don't have souls either. Does that mean heaven looks like a cement parking lot? I suppose this is what the nuns call a theological problem." 33. "When my children were born, I didn't have them baptized because I felt baptism was about erasing Original Sin - something the Church said children got from their mother - and I absolutely refused to believe women carry Original Sin." 34. "It was about 5 years after I was baptized before the pull of sin finally stopped." 35. "Okay, God, I thought. Get me out of this and I'll stop my half-assed church-going ways. You got me past a pack of Strigoi tonight. I mean, trapping that one between the doors really shouldn't have worked, so clearly you're on board. Let me get out of here, and I'll...I don't know. Donate Adrian's money to the poor. Get baptized. Join a convent. Well, no. Not that last one." 36. "We're a Muslim family, but we're also very cultured and we have a mixture of different religions. For example, my brother-in-law is Catholic, and my sister converted and my nephews are baptized. I have an uncle who just graduated and currently he's a priest." 37. "It's not like Massachusetts, where they're baptized Democrats." 38. "As we were baptized, so we profess our belief. As we profess our belief, so also we offer praise. As then baptism has been given us by the Savior, in the name of the Father and of the Son and of the Holy Ghost, so, in accordance with our baptism, we make the confession of the creed, and our doxology in accordance with our creed." 39. 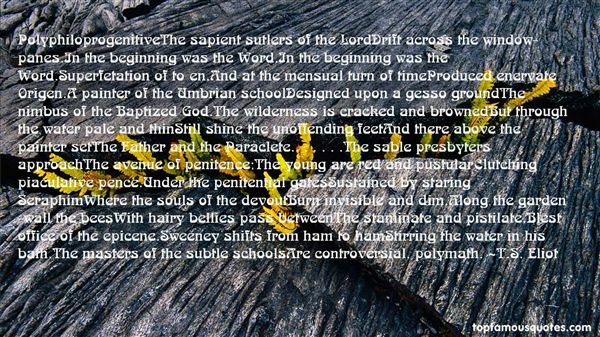 "PolyphiloprogenitiveThe sapient sutlers of the LordDrift across the window-panes.In the beginning was the Word.In the beginning was the Word.Superfetation of to en,And at the mensual turn of timeProduced enervate Origen.A painter of the Umbrian schoolDesigned upon a gesso groundThe nimbus of the Baptized God.The wilderness is cracked and brownedBut through the water pale and thinStill shine the unoffending feetAnd there above the painter setThe Father and the Paraclete.. . . . . .The sable presbyters approachThe avenue of penitence;The young are red and pustularClutching piaculative pence.Under the penitential gatesSustained by staring SeraphimWhere the souls of the devoutBurn invisible and dim.Along the garden-wall the beesWith hairy bellies pass betweenThe staminate and pistilate,Blest office of the epicene.Sweeney shifts from ham to hamStirring the water in his bath.The masters of the subtle schoolsAre controversial, polymath." 40. "Prominent Christians in Constantine's time waited to be baptized until their deathbeds lest they commit a "major"sin that couldn't be forgiven of those already baptized. Others felt anyone who did anything to avoid martyrdom were apostates had no valid subsequent ministry." 41. "He baptized his adopted child, and named him Quasimodo, either because he wished to mark in this way the day upon which the child was found, or because he wished to show by this name how imperfect and incomplete the poor little creature was. Indeed, Quasimodo, one eyed, hunchbacked, and knock kneed, was hardly more than half made." 42. "I take thee at thy word:Call me but love, and I'll be new baptized;Henceforth I never will be Romeo." 43. "And as the circumcised in the flesh, and not in the heart, have no part in God's good promises; even so they that be baptized in the flesh, and not in heart, have no part in Christ's blood." 44. "(COMPARE)- Our birth is but a dream and a forgetting (Wordsworth)- ...so schläft er sehr rasch wieder ein, und schon nach vierundzwanzig Stunden ist es, als sei man niet weg gewesen und als sei die Reise der Traum einer Nacht. (Thomas Mann)- Thetis baptized her mortal son in Styx;A mortal mother would on Lethe fix. (Byron)"
We should have high expectations of our children, but politicians should not tell teachers how to meet them."